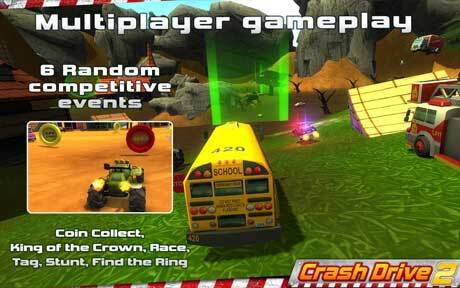 A sequel to the awesome off-road racing game Crash Drive 3D! Pick your car at the garage and get ready for some fun, mad, free-roaming driving experience. Tank Battle Mode! Choose and customize your tank and ride it into battle. Try to push as many other players’ tanks out of the five arenas to become the ultimate tank master. Level up your Tank Battle level to the max by earning special points, and unlock all five tanks. You can find Tank Battles in the level selection screen. 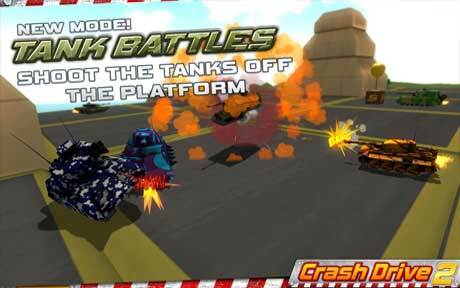 Whether you’re driving a bus, a classic muscle car, or a monster truck—you go your own way in this multiplayer stunting game. Speed across a huge map equipped with plenty of bizarre terrain to make the race intense. Collect coins, upgrade your ride, and WIN the off-road race! Improve stats of your vehicle at the shop, maximize the acceleration and the speed). ⊗ 4 endless levels (Open Worlds) to explore…can you find all the secret areas? 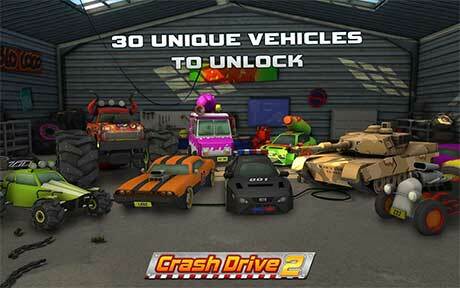 This car game has already been downloaded more than 3 million times !